The ancient inhabitants of Anatolia spoke the now-extinct Anatolian languages, which were largely replaced by the Greek language starting from classical antiquity and during the Hellenistic, Roman and Byzantine periods. 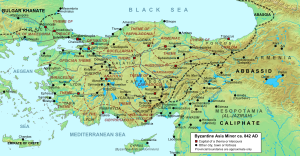 Major Anatolian languages included Hittite, Luwian, and Lydian, among other more poorly attested relatives. The Turkification of Anatolia began under the Seljuk Empire in the late 11th century and continued under the Ottoman Empire between the late 13th and early 20th centuries. 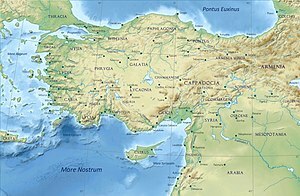 However, various non-Turkic languages continue to be spoken by minorities in Anatolia today, including Kurdish, Neo-Aramaic, Armenian, Arabic, Laz, Georgian and Greek. 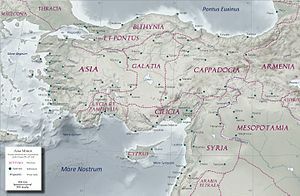 Other ancient peoples in the region included Galatians, Hurrians, Assyrians, Hattians, Cimmerians, as well as Ionian, Dorian and Aeolian Greeks. During the 6th century BC, all of Anatolia was conquered by the Persian Achaemenid Empire, the Persians having usurped the Medes as the dominant dynasty in Iran. 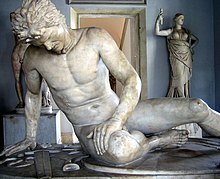 In 499 BC, the Ionian city-states on the west coast of Anatolia rebelled against Persian rule. The Ionian Revolt, as it became known, though quelled, initiated the Greco-Persian Wars, which ended in a Greek victory in 449 BC, and the Ionian cities regained their independence. By the Peace of Antalcidas (387 BC), which ended the Corinthian War, Persia regained control over Ionia. ^ Dandamaev, M. A. (1989). A Political History of the Achaemenid Empire. Brill. p. 294. ISBN 978-9004091726. ^ Schmitt, R. (1986). "ARTAXERXES II". Encyclopaedia Iranica, Vol. II, Fasc. 6. pp. 656–658.